This is a look into the design process that took place during the creation of the ComfortQuest Hunting Blinds and ComfortQuest SPORT Chairs. From this you can glean why Dave Smith, President of SmithWorks Outdoors, believes he is delivering the best hunting products for the money! The ComfortQuest Hunting Blinds and SPORT Chairs had to be COMFORTABLE! 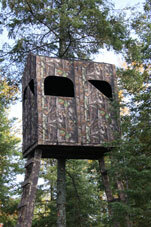 Hunters wanted a blind that could protect them from the elements for hours on end. They also wanted a chair they could be comfortable in. Dave Smith used a highly water resistant polyester fabric that keeps out the wind and rain and resists deterioration for the ComfortQuest Blinds and ComfortQuest Chairs. Hunters wanted the ComfortQuest Hunting blind to be tall enough to stand up in, but not so big that they couldn't easily reach their gear. They also wanted a larger size blind to accommodate more than one person. Hunters wanted a chair that would accommodate different sitting heights. The ComfortQuest Blinds now come in two sizes 4x4 and 4x6, both have a full stand-up 6'6" height. They accommodate your favorite hunting chair (the ComfortQuest SPORT or "Big Boy" SPORT Chair) and additional gear. Hunters wanted windows that could provide more protection from the elements. The ComfortQuest Hunting Blinds have optional Mesh Screen and Vinyl Window Packages. The Mesh Screens provide air circulation, insect prevention and added concealment, while the Clear Vinyl Windows provide protection from wind, rain and cold temperatures. The two window types can also be used together for maximum protection. The ComfortQuest Hunting Blinds and SPORT Chairs had to be AFFORDABLE! Dave Smith wanted to make the cost of the ComfortQuest Hunting Blinds and SPORT Chairs affordable to all hunters. Dave chose not to produce rigid, fiberglass or wood blinds that are heavy and expensive, but rather he chose a study aluminum frame and heavy-duty fabric for both the ComfortQuest Blinds and SPORT Chairs, thus making the cost low and the quality superior. The ComfortQuest Hunting Blinds and ComfortQuest SPORT Chairs had to be FLEXIBLE! Many hunters already had hunting platforms or stands. They just wanted a blind that could be used with what they already had or could easily build. The ComfortQuest Blinds can be installed on any 4' x 4' or 4' x 6' platform. Complete instructions and diagrams on how to construct a 12' stand with platform are available on this web site. (See Customer Service) An optional Ground Blind Frame is available to adapt the ComfortQuest Blinds for use as Ground Blinds. Hunters wanted a blind with windows on all sides that could be used in many different configurations. The ComfortQuest Blinds have zippered windows on all sides, each with two pair of zipper slides, allowing the hunter to configure the windows in accordance with their sight lanes. Hunters wanted a chair that would adjust to their leg length and accommodate their heavy hunting clothing. The ComfortQuest SPORT Chairs have legs that adjust from 13" to 18" and an oversize seat (16"x 22" for SPORT Chair and 18"x 24" for "Big Boy" SPORT Chair. The ComfortQuest Hunting Blinds and SPORT Chairs had to be DURABLE! Hunters wanted a blind and chair that would last for many hunting seasons. The ComfortQuest Hunting Blinds and SPORT Chairs include a lightweight, yet sturdy powder coated aluminum frame. The aluminum fabrication creates a long life structure. The fabric blinds and SPORT Chairs can withstand the elements. They are made of heavy-duty flame retardant fabric which is 600 Denier coated polyester. The blinds also have double stitched seams and genuine YKK zippers for added durability. 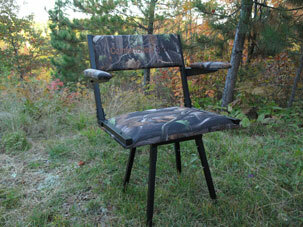 The ComfortQuest Hunting Blinds and SPORT Chairs had to PROVIDE CONCEALMENT! 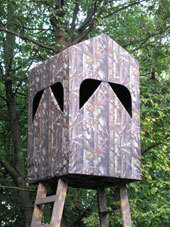 Hunters needed to be invisible and quiet while in their blind. The ComfortQuest Hunting Blinds and SPORT Chairs use a universal camouflage fabric, Next Camo G-1, that blends into most environments. The frames are made of black powder coated aluminum and the fabric blinds feature a blackout interior to provide optimum concealment. The optional magnetic mount Screens and Vinyl Window Packages can be combined to allow the hunter to see out, while any movement inside is concealed. The magnetic mounted screens and windows can be added and removed silently. Bungees in each corner of the blinds and D-rings on the bottom hem guarantee a snug fit between the blind and frame to minimize wind movement and noise. The ComfortQuest Hunting Blinds and SPORT Chairs had to be EASY TO TRANSPORT & INSTALL! 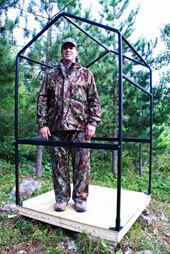 Hunters needed a blind and chair whose size and weight would allow it to be transported to a hunting stand and easily installed in minutes by one person. The ComfortQuest Hunting Blinds include the Aluminum Frame, Fabric Blind, Carry Bag and an owner's manual. The ComfortQuest SPORT Chairs fold up with legs stowed on chair back and weigh just 16 lbs for the SPORT Chair and 19.5 lbs for the "Big Boy" SPORT Chair. The ComfortQuest heavy-duty Carry Bag, with adjustable pack straps, sternum strap and carry handles allows one hunter to easily transport the frame, blind and all accessories out to his/her field location. The ComfortQuest Hunting Blinds use friction-fit nylon connectors to allow the hunter to snap the Aluminum Frame pieces together and in minutes cover the frame with the Fabric Blind. The ComfortQuest SPORT Chairs back and arms fold into place, while the legs install into the base with convenient push buttons. The ComfortQuest Hunting Blinds and SPORT Chairs are now complete. The Hunter is ready to enjoy his/her sport with Ease and Comfort!